Medlio is proud to announce the launch of its secure digital health insurance card that can be displayed on a smart phone, similar to the e-boarding passes now available for airline flights. 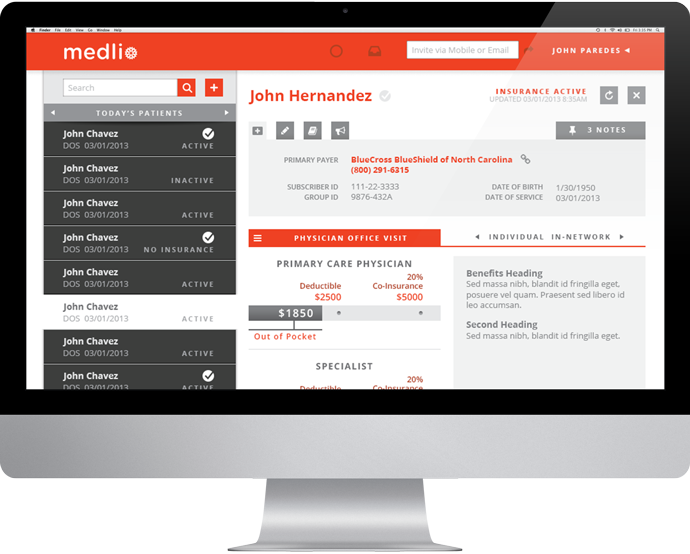 Medlio provides healthcare consumers with immediate access to current insurance information. Everyone can set up an account today and capture an image of their insurance card. Most users will also be able to access real time benefits including progress towards their deductibles and expected copays or coinsurances for various services. Many insurance companies’ benefits are already accessible, and Medlio is working feverishly to add even more who have signed up through the company’s website. 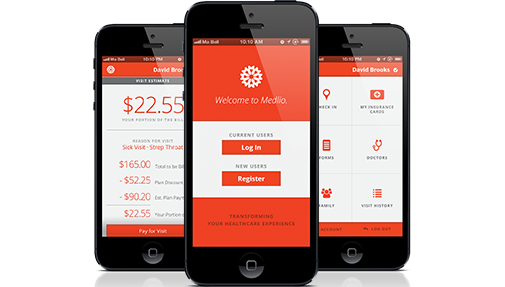 But Medlio is not just building an insurance card app. The company aims to connect patients directly with their doctors and insurance companies all on one simple communications platform. In addition to insurance benefits data, Medlio also currently allows people to easily find doctors and facilities from the app’s provider search functionality. Soon app users will also be able to schedule an appointment, check in, share insurance information and medical forms, get a cost estimate and pay for their visit all with just a few taps on their smart phone. David Brooks, Medlio co-founder and CEO developed the idea for Medlio after starting and managing a primary care practice for several years. He realized the lack of cost transparency and antiquated billing processes were a critical problem for healthcare consumers as the rise in High Deductible Health Plans (HDHPs) shift more and more of the healthcare costs onto them. This year, 66 percent of companies with 1,000 employees or more offered at least one HDHP. That number is expected to jump to 80 percent by next year. According to Towers Watson, by this time next year, one out of every four big employers will only offer HDHPs. “Yesterday’s patients are swiftly becoming tomorrow’s consumers as more of the cost and responsibility of their care falls upon them,” said Brooks. "It’s become critical to simplify and clarify the healthcare check in and payment process. This is a problem both patients and providers desperately need solved now." To use the service, patients download the Medlio app from the Apple App Store™ or Google Play® or visit the Medlio website (medl.io). Registration is a quick three-step process. Patients just enter their name, insurance plan, and their primary provider. Medlio then shows real-time health plan benefits information, along with the ability to share insurance details and medical forms data with their providers. Providers can register with Medlio at medl.io/providers and payers can register at medl.io/payers to signup for the wait list. To learn more about Medlio, please visit the Medlio Speakeasy, or access information via Twitter, or on Facebook. Medlio, founded in 2013, builds tools and technology that empower consumers to get involved as never before in the management of their own care. Medlio graduated from the inaugural DreamIt Health accelerator program sponsored by Penn Medicine and Independence Blue Cross. The company’s first tool, a virtual health insurance card, puts the traditional static insurance card— currently the only intersection between patients, providers, and payers—on a single, secure, real-time communications platform. It is a simple, yet sophisticated solution bringing patients from the periphery to the center of healthcare by fostering new attitudes and awareness around healthcare consumption.